Hello there! My name is Cassie and I am super excited to be able to teach you! I went to school and got my associate of arts at St. Charles Community College, received my Bachelor of music and Masters of music in oboe performace at the University of Massachusetts - Amherst and am currently in the progress of getting my teaching certification at the Univeristy of Missouri - St. Louis. I have played in all sorts of wind ensembles and orchestras at all of the schools that I have attended over the past few years. 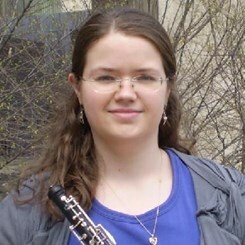 I taught oboe in the Mehlville school district and was a teaching assistant at the University of Massachusetts - Amherst. When it comes to teaching, I believe that everyone can learn about music and play an instrument. In my lessons I teach my students about music theory, history, and the fundamentals of playing oboe or bassoon, I focus on how to practice effectivley so that when the student is at home, they know how to continue workin and learning on their own. It is also important to me that each and every student has fun playing music! I am looking forward to be able to make some wonderful music with you! Request Lessons with Cassandra today!